Circular base plate with a shaped, pierced and decorated handle. On the nocturnal side that base plate has a blank circular edge and within this a series of concentric scales. The first two form a zodiacal calendar (the first point of Aires is at 11 January), with the months named in Latin and divided to 2 days, numbered by 10 (adapted to each month), and the zodiac with signs, constellation devices and planetary symbols, each sign with a scale of 30 degrees, divided to 10, subdivided to 1, numbered by 10. There are four concentric scales of numbered dots within the zodiac scale: two (for length of day and night) with numbers 8 to 16 to 8, two (for sunrise and sunset) with numbers 4 to 8 to 4 and dots for the half-hours. The final scale is divided into the four seasons: 'VER', '?STAS', 'AVTVMNVS', 'HYEMS'. Above the plate, secured by a central pierced screw and nut, is an hour ring covering the blank outer portion of the base plate, connected to a central disc by 7 curved bands. The hour ring is divided 1 to 12 twice, subdivided to 1/4 hour, numbered by 1 and with a stud at each hour. Mounted on each band is a hand with part of a sleeve and a finger pointing to one of the seven scales. The bands are marked (respective to the scales listed above): 'DIES MENSIVM', GRADVS ZODIACI', 'LONGITVDO DIEI', 'LONGITVDO NOCTIS', 'ORTVS SOLIS', 'OCCASVS SOLIS', 'QVATVOR ANNI PARTES'. Several of the arms have been repaired with solder. Above the hour ring is a shaped and decorated index arm, incomplete, for the nocturnal. There is a small inscription on the blank portion of the base plate, usually obscured by the hour ring: '15[?] AVG'. The '5' is not entirely clear, but there is a dot close to the inscription and a straight line from the centre through this dot crosses the calendar scale at 15 August or 0 Scorpio. The reverse side has a horizontal sundial. 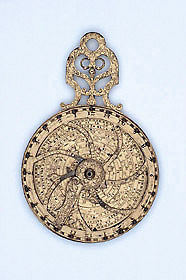 A folding gnomon, with a spring plate, is adjustable for latitudes 45, 48, 51 and 54, and there are four corresponding hour scales, marked with their latitudes, alternate scales being marked with hours 4 to 12 to 8 in Roman and Arabic numerals. An outer band is decorated with foliage and snakes. A circle and central point for a magnetic needle (missing) lacks a cover, to secure which there are two holes in the base-plate; cardinal points marked 'MERIDIES', 'OCCIDENS', SEPTENTRIO', 'ORIENS'; target line offset for magnetic variation. On this face, next to the handle is a catch, and opposite this holes for a hinge fitting. The handle is decorated with figures, grotesque faces, plants and animals.